If you wear frequent replacement contact lenses you’re probably aware that you need a good contact lens solution to accompany them to ensure they’re kept clean and disinfected on a regular basis. Lens solutions are also used for storing weekly and monthly soft contact lenses or rigid gas permeable lenses. At Vision Direct we provide a range of different solutions to cater for everyone’s needs including multi-purpose cleaning solutions, hydrogen peroxide system and gas permeable lens solutions. Most of solutions come in handy two or three month packs with essential contact lens cases for storage, and are designed to be used within 2-6 months of opening. 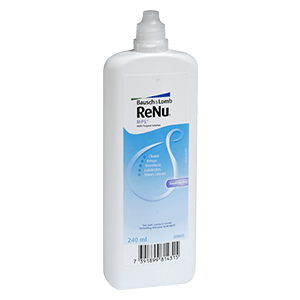 Some of our bestsellers include ReNu MPS Multi-Purpose Solution, Opti-Free Puremoist and Complete RevitaLens. We also sell a great assortment of travel packs designed for regular travellers and holidaymakers who would rather carry a small bottle of solution that meets airport regulations.